PRIME MINISTER NETANYAHU: We had an opportunity today to begin discussing the wide range of issues that are critical to both our countries, and foremost among these is Iran’s relentless pursuit of nuclear weapons. Mr. President, you have made it clear that you are determined to prevent Iran from developing nuclear weapons. I appreciate your forthright position on this point. I also appreciate that you have noted, that you have acted to thwart this threat, both through determined diplomacy and strong sanctions that are getting stronger yet. Notwithstanding our joint efforts and your great success in mobilizing the international community, diplomacy and sanctions so far have not stopped Iran’s nuclear program. And as you know, my view is that in order to stop Iran’s nuclear programs peacefully, diplomacy and sanctions must be augmented by a clear and credible threat of military action. In this regard, Mr. President, I want to thank you once again for always making clear that Israel must be able to defend itself by itself against any threats. I deeply appreciate those words because they speak to the great transformation that has occurred in the life of the Jewish people with the rebirth of the Jewish state. The Jewish people only two generations ago were once a powerless people, defenseless against those who sought our destruction. Today we have both the right and the capability to defend ourselves. As you said earlier today, the essence of the State of Israel, the essence of the rebirth of the Jewish state, is the fulfillment of the age-old dream of the Jewish people: to be masters of our fate in our own state, and I think that was a wonderful line that I will cherish, because it really gets down to the essence of what this state is about. That is why I know that you appreciate that Israel never cede the right to defend ourselves to others, even to the greatest of our friends, and Israel has no better friend than the United States of America. So I look forward to continue to work with you to address what is an existential threat to Israel, and a great threat to the peace and security of the world. Mr. President, we discussed today the situation in Syria. We share the goal of seeing a stable and peaceful Syria emerge from the carnage that we have witnessed over the last two years. That carnage is already resulted in the deaths of over 70,000 people and the suffering of millions. We also share a determination to prevent the deadly arsenal of weapons within Syria from falling into terrorist hands. And I have no doubt that the best way to do that is to work closely with the United States and other countries in the region to address this challenge; and that is what we intend to do. Finally, Mr. President, your visit gave us an opportunity to try to find a way to advance peace between Israelis and Palestinians. My new government was sworn in two days ago. I know there have been questions regarding what the policy of the new government will be towards peace with the Palestinians. So let me be clear: Israel remains fully committed to peace and to the solution of two states for two peoples. We extend our hands in peace and in friendship to the Palestinian people. I hope that your visit, along with the visit of Secretary of State Kerry will help us turn a page in our relations with the Palestinians. Let us sit down at the negotiating table. Let us put aside all preconditions. Let us work together to achieve the historic compromise that will end our conflict once and for all. Let me conclude, Mr. President, on a personal note: I know how valuable the time and the energies of the American president, of yourself. This is the tenth time that we have met since you became President and since I became Prime Minister. You’ve chosen Israel as your first venue in your foreign visits in your second term. I want to thank you for the investment you have made in our relationship, and in strengthening the friendship and alliance between our two countries. It is deeply, deeply appreciated. You have come here on the eve of Passover. I’ve always considered it as our most cherished holiday. It celebrates the Jewish people’s passage from slavery to freedom. Through the ages, it has also inspired people struggling for freedom, including the founding fathers of the United States. So it’s a profound honor to host you, the leader of the free world, at this historic time in our ancient capital. Mr. President. Welcome to Israel, welcome to Jerusalem. Well, thank you, Prime Minister Netanyahu, for your kind words and for your wonderful welcome here today. And I want to express a special thanks to Sara as well as your two sons for their warmth and hospitality. It was wonderful to see them. They are – I did inform the Prime Minister that they are very good-looking young men who clearly got their looks from their mother. PRIME MINISTER NETANYAHU: Well, I can say the same of your daughters. As leaders, our most solemn responsibility is the security of our people – that’s job number one. My job as President of the United States, first and foremost, is to keep the American people safe. Bibi, as Prime Minister, your first task is to keep the people of Israel safe. And Israel’s security needs are truly unique, as I’ve seen myself. In past trips I visited villages near the Blue Line. I’ve walked through Israeli homes devastated by Hezbollah rockets. I’ve stood in Sderot, and met with children who simply want to grow up free from fear. And flying in today, I saw again how Israel’s security can be measured in mere miles and minutes. In short – and I don’t think this is just my opinion, I think, Bibi, you would share this – America’s support for Israel’s security is unprecedented, and the alliance between our nations has never been stronger. In this regard, I’d note that last year was a milestone – the first year in four decades when not a single Israeli citizen lost their life because of terrorism emanating from the West Bank. It’s a reminder that Israel has a profound interest in a strong and effective Palestinian Authority. And as the Prime Minister’s new government begins its work, we’ll continue to look for steps that both Israelis and Palestinians can take to build trust and confidence upon which lasting peace will depend. Assad has lost his legitimacy to lead by attacking the Syrian people with almost every conventional weapon in his arsenal, including Scud missiles. And we have been clear that the use of chemical weapons against the Syrian people would be a serious and tragic mistake. We also share Israel’s grave concern about the transfer of chemical or other weapon systems to terrorists – such as Hezbollah – that might be used against Israel. The Assad regime must understand that they will be held accountable for the use of chemical weapons or their transfer to terrorists. Mr. Prime Minister, like families across Israel, you and your family have served and sacrificed to defend your country and to pass it, safe and strong, to your children just as it was passed on to you. Standing here today, I can say with confidence that Israel’s security is guaranteed because it has a great deal on its side, including the unwavering support of the United States of America. Q: Mr. President, may I ask you about Syria a practical question and a moral one? Morally, how is it possible that for the last two years, tens of thousands of innocent civilians are being massacred, and no one in the world, the United States and you, are doing anything to stop it immediately. On a practical level, you have said today and also in the past that the use of chemical weapons would be crossing of a red line. It seems that this red line was crossed yesterday. What specifically do you intend to do about it? With respect to chemical weapons, we intend to investigate thoroughly exactly what happened. Obviously, in Syria right now you’ve got a war zone. You have information that’s filtered out, but we have to make sure that we know exactly what happened – what was the nature of the incident, what can we document, what can we prove. So I’ve instructed my teams to work closely with all of the countries in the region and international organizations and institutions to find out precisely whether or not this red line was crossed. The broader point is, is that once we establish the facts I have made clear that the use of chemical weapons is a game changer. And I won’t make an announcement today about next steps because I think we have to gather the facts. But I do think that when you start seeing weapons that can cause potential devastation and mass casualties and you let that genie out of the bottle, then you are looking potentially at even more horrific scenes than we’ve already seen in Syria. And the international community has to act on that additional information. But as is always the case when it comes to issues of war and peace, I think having the facts before you act is very important. More broadly, as I said in my opening statement, I believe that the Assad regime has lost all credibility and legitimacy. I think Assad must go – and I believe he will go. It is incorrect for you to say that we have done nothing. We have helped to mobilize the isolation of the Assad regime internationally. We have supported and recognized the opposition. We have provided hundreds of millions of dollars in support for humanitarian aid. We have worked diligently with other countries in the region to provide additional tools to move towards a political transition within Syria. If your suggestion is, is that I have not acted unilaterally militarily inside of Syria, well, the response has been – or my response would be that, to the extent possible, I want to make sure that we’re working as an international community to deal with this problem, because I think it’s a world problem, not simply a United States problem, or an Israel problem, or a Turkish problem. It’s a world problem when tens of thousands of people are being slaughtered, including innocent women and children. Q: There was some friendly banter between you two gentlemen on the tarmac today about red lines, and I’m wondering how much of a serious matter that actually became in your talks and will be in your talks to come tonight. President Obama has said it will take Iran at least a year to build a bomb. That’s months longer than the Prime Minister believes. Mr. Prime Minister, has President Obama’s words – have they convinced you that he is putting forth the credible military threat that you have repeatedly asked for, or there’s a need to go further? Thank you. PRESIDENT OBAMA: Bibi, why don’t you go – take a first swing at this. PRIME MINISTER NETANYAHU: Well, first of all, there are so many strips of different colors on the tarmac that we did have a joke about that, but obviously this matter is no joke. It relates to our very existence, and to something also that the President correctly identified as a grave, strategic threat to the United States and to the peace and security of the world. I’m absolutely convinced that the President is determined to prevent Iran from getting nuclear weapons. I appreciate that. And I also appreciate something that he said, which I mentioned in my opening remarks: that the Jewish people have come back to their own country to be the masters of their own fate. And I appreciate the fact that the President has reaffirmed, more than any other President, Israel’s right and duty to defend itself by itself against any threat. We just heard those important words now, and I think that sums up our, I would say our common view: Iran is a grave threat to Israel, a grave threat to the world – a nuclear Iran. The United States is committed to deal with it. Israel is committed to deal with it. We have different vulnerabilities, obviously, and different capabilities. We take that into account, but what we do maintain, and the President, I think, is the first to do so, is that Israel has a right to independently defend itself against any threat including the Iranian threat. I think that what Bibi alluded to, which is absolutely correct, is each country has to make its own decisions when it comes to the awesome decision to engage in any kind of military action, and Israel is differently situated than the United States. And I would not expect that the Prime Minister would make a decision about his country’s security and defer that to any other country – any more than the United States would defer our decisions about what was important for our national security. And it would be in everybody’s interests – not just Israel’s interests, not just the United States’ interests – it would be in the interest of the Iranian people if this gets resolved diplomatically. Because the truth of the matter is, is that the most permanent solution to the Iranian situation is ultimately going to be their decision that it is not worth it for them to pursue nuclear weapons. That will be the lasting change. If we can get that, that’s good for everybody, including Iran, because it would allow them to break out of the isolation that has hampered their society and their economic development for many years. But I don’t know whether they’re going to be willing to take that step. And obviously, their past behavior indicates that, in the words of – or a play on words on what Ronald Reagan said – we can’t even trust yet, much less verify. But we do have to test the proposition that this can be resolved diplomatically. And if it can’t, then I’ve repeated to Bibi what I’ve said publicly, and that is, is that we will leave all options on the table in resolving it. Q: Welcome, Mr. President. On your way back to Washington on Friday, what will you consider a successful visit? Convincing the Israeli leaders that they can rely on you on the Iranian issue, especially that I learned that there are differences between Israel and the United States concerning the enrichment of the uranium? Or convincing both sides, Israelis and Palestinians, to revive the floundering negotiations, reviving the floundering peace process? In that context, what I have also sought to achieve here is further consultations, building on what we’ve already discussed – as Bibi has just formed a new government, as I am entering my second term – that we continue to have close consultation around some of these shared interests that we’ve already discussed, Iran being obviously a prominent shared concern. I want to make sure that the Israeli people and the Israeli government consistently understand my thinking and how I’m approaching this problem. And I want to understand how the Israeli government and the Prime Minister is approaching this problem to make sure that there are no misunderstandings there. There’s some elements of good news. I mean, the fact of the matter is, is that even with all that’s been happening in the region, the Palestinian Authority has worked effectively in cooperation with the international community – in part because of some of the training that we, the United States, provided – to do its part in maintaining security in the West Bank. We have seen some progress when it comes to economic development and opportunity for the Palestinian people. But the truth of the matter is trying to bring this to some sort of clear settlement, a solution that would allow Israelis to feel as if they’ve broken out of the current isolation that they’re in, in this region, that would allow the incredible economic growth that’s taking place inside this country to be a model for trade and commerce and development throughout the region at a time when all these other countries need technology and commerce and jobs for their young people, for Palestinians to feel a sense that they, too, are masters of their own fate, for Israel to feel that the possibilities of rockets raining down on their families has diminished – that kind of solution we have not yet seen. And so what I want to do is listen, hear from Prime Minister Netanyahu – tomorrow, I’ll have a chance to hear from Abu Mazen – to get a sense from them, how do they see this process moving forward. What are the possibilities and what are the constraints, and how can the United States be helpful? And I purposely did not want to come here and make some big announcement that might not match up with what the realities and possibilities on the ground are. I wanted to spend some time listening before I talked – which my mother always taught me was a good idea. And so, hopefully – I’ll consider it a success if when I go back on Friday, I’m able to say to myself I have a better understanding of what the constraints are, what the interests of the various parties are, and how the United States can play a constructive role in bringing about a lasting peace and two states living side by side in peace and security. Q: Mr. President, I’m going to follow up a little bit on the peace process. You began your term, your first term, big fanfare – Cairo speech to talk to the Muslim world, the decision to have a Middle East envoy early. You said you weren’t going to let this slip to your second term. 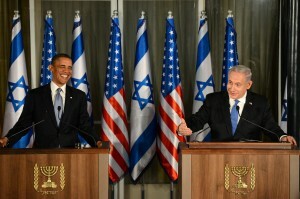 We’re in your second term with the Middle East peace process. What went wrong? Why are we further away from a two-state solution? I know you said you want to talk more about this tomorrow, but I am curious. What do you believe went wrong? Did you push Israel too hard? What do you wish you would have done differently? And, Mr. Prime Minister, I want to help out my colleague over here on the follow-up that he had, which had to do with do you accept the President’s understanding that Iran is a year away when it comes to nuclear weapons? And another question I had for you – I guess my question to you was going to be, why do you believe the Israeli people have not embraced President Obama the same way they embraced our last two U.S. Presidents? Thank you. PRESIDENT OBAMA: The opening premise of your question was that having failed to achieve peace in the Middle East in my first term that I must have screwed up somehow. And I will tell you I hope I’m a better President now than when I first came into office, but my commitment was not to achieve a peace deal in my first year, or in my second year or my third year. That would have been nice. What I said was I was not going to wait to start on the issue until my second term, because I thought it was too important. And that’s exactly what I did. And my goal here is just to make sure that the United State is a positive force in trying to create those opportunities as frequently as possible, and to be as clear as possible as to why we think that this is an important priority – not only because of some Pollyanna-ish views about can’t we all get along and hold hands and sing “Kumbaya,” but because I actually believe that Israel’s security will be enhanced with a resolution to this issue. I believe that Palestinians will prosper and can channel their extraordinary energies and entrepreneurship in more positive ways with a resolution to this issue. The entire region I think will be healthier with a resolution to this issue. And there have probably been times where, when I’ve made statements about what I think needs to happen, the way it gets filtered through our press – it may be interpreted in ways that get Israelis nervous, just like there are folks back home who sometimes get nervous about areas where they aren’t sure exactly where I stand on things. That’s why I always like the opportunity to talk directly to you guys. Hopefully, you’ll show the live film, as opposed to the edited version. With that, I think you’ve got four questions to answer, Bibi. PRIME MINISTER NETANYAHU: I think that there’s a misunderstanding about time. If Iran decides to go for a nuclear weapon, that is to actually manufacture the weapon, then it will take them about a year. I think that’s correct. They could defer that a long time but still get through the enrichment process. To make a weapon you need two things. You need enriched uranium of a critical amount and you need a weapon. You can’t have the weapon without the enriched uranium but you can have the enriched uranium without the weapon. Iran, right now, is enriching uranium. It’s pursuing it. It hasn’t yet reached the red line that I had described in my speech at the UN. They’re getting closer though. The question of manufacturing the weapon is a different thing. The President said correctly that we have, on these issues that are a little arcane, they sound a little detailed to you, but on these matters we share information and we have a common assessment. In any case, Iran gets to an immunity zone when they get through the enrichment process, in our view. Whatever time is left, there’s not a lot of time. And every day that passes diminishes it. But we do have a common assessment on these schedules, on intelligence. We share that intelligence and we don’t have any argument about it. I think it’s important to state that clearly. I think that people should get to know President Obama the way I’ve gotten to know him and I think you’ve just heard something that is very meaningful. It might have escaped you but it hasn’t escaped me and that is the president announced that in addition to all the aid that his administration has provided, including iron Dome, including defense funding for Israel during very difficult times, he has announced that we’re going to begin talks on another ten-year process arrangement to ensure American military assistance to Israel. I think this is very significant. And I want to express my thanks for everything that you have done and I want to thank you also for that statement you just made. I think it’s very, very important. So I think Israelis will judge this by the unfolding events and by what’s happening, what is actually taking place. And for this, you know, there’s a very simple answer to your question. For this you need, you see, a second term as President and a third term as Prime Minister. That really fixes things. PRESIDENT OBAMA: All right, thank you very much, everybody.